Today’s podcast is in response to an email from Matt in Arizona. He writes, “Hi Mark, I’m really enjoying your podcasts. They go great with your RussianAccelerator course, which is why I’m writing. In Unit 4 we learn how to say Ты хочешь but I’m hoping you can elaborate on when you need to say Ты and when you can leave it off. Spasibo! Matt, Chandler, AZ. You’re in a cafe. How should you greet the waitress? …as she pulls out her pad and pen. We’re not sure exactly what she said, but it’s pretty clear she’s ready to take our order. So ask her…. Yes, there is spaghetti and there is pizza. Да, есть спагетти и пицца. Ok, I’ll have pizza and a salad, please. Хорошо. Я буду пиццу и салат, пожалуйста. Ah, at last a word we understand! She said coffee. So she must be asking if we want something to drink. Ask her if there’s cappuccino. She replies: Yes, there is. Хорошо. Значит пиццу, салат и капучино. And she says “You’re welcome” as she walks off. Есть пицца? Хорошо, я буду. Do you have a feel for the flow of these conversations? Let’s go through them again. He said: Hey Mark, want a Sprite? She’s asking us formally, What do you want? Now let me stop there for a second. Imagine you have a friend who’s also studying Russian but he’s not as advanced as you are. And he says, “Wait a second. I’m pretty sure the word for caviar ends in an “a” sound. икра. Why did you say хочешь икру? Why the “u” sound? My answer would be: Because when you do something to words that end in an “ah” sound — what we call feminine nouns — they change their ending to an “uu” sound. And wanting them counts as doing something to them. That’s one of the ways to say “you” when talking to a friend. And Matt wants to know, when do we add it before the word хочешь? See? There I was making a statement: You want pizza. I had to add the word ты there. …it sounds like I’m offering him vodka. But since we’re more likely to offer our friends something than we are to make statements about the things they want, you’ll mostly be asking just: Хочешь? And as a parting thought on the topic, that’s perhaps the most common version yet. You just hold out the thing you’re offering and ask: Хочешь? This is my friend Charlie. Or: This is my friend Monica. No. This is your coffee. Yes, this is your pasta. Yes, this is your salad. Say: This is your yogurt and your muffin. Это твой йогурт и твой маффин. So the main point here is to be sure to circulate older material with newer material. Even just adding one new word — like adding “and” as we did in episode #6 — should make you go back and apply it to earlier material. Remember the word “and”, as in: I’ll have pizza and a salad, please. Я буду пиццу и салат, пожалуйста. This is my mom and this is my dad. Это моя мама и это мой папа. Mom is a musician and dad is an engineer. Мама музыкант и папа инженер. Did you catch that? He said: мою пиццу. So, what’s going on here? Basically, we have our two main grammar patterns working at the same time. We know that the adjective my has to rhyme with vodka. That’s pattern #1. If you got all these, you should honestly feel really good about your progress. Those are not easy…it’s actually pretty advanced stuff. But the underlying idea is kinda simple, isn’t it? Remember, grammar is all about patterns. Not rules and charts and fancy terms. Finally, you may’ve noticed we only learned one new word today. That’s not me trying to be stingy. When you first start in a new language, the brain is a sponge and it can absorb a lot of words. That’s why we were learning eleven new words in that very first podcast. But soon the spots kind of fill up, and so we taper off new stuff and we concentrate on mastering what we have. As your current vocabulary becomes second nature — which it pretty much is, by the way…just about, after this podcast — then the brain feels ready for the next wave of new vocabulary. That’s really how language learning works. Anyway, head on over to RussianMadeEasy.com for the transcript and audio exercises, and I’ll see you in the next episode where you’ll learn to talk about what you want. Notice how he says “pizzu” because he’s still asking if you want pizza, which counts as doing something to the pizza. Say: There is pizza? Ok, I will. I was wondering, why dont you make this podcast available on the apple podcast app? I find it difficult to listen to it on the go! Thanks for writing. Glad you’re enjoying my podcasts. You could tell the waitress, “Ya hochu pivo” but (just as in English) you’d come off as pretty rude. Hey mark (praying you’ll respond), your podcasts are super helpful to me. Thank you so much but I have a question. What exactly is considdred a grammar construction? I get that “Ya budu”, “Eto moy”, “Eto tvoy”, but I exaclty know what to write down. Can you help me on this? A construction is simply a fill-in-the-blank phrase. Is it useful to know? Does it help me learn a new grammar concept? Я хочу _____ (I want _____ ) Is a great choice. It’s useful, and we learn a useful grammar pattern. This is how all my courses are designed. 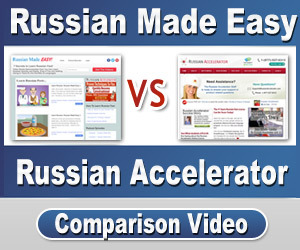 This podcast, my Russian Accelerator courses, and my fast Track to Russian Fluency course. They all use constructions which are useful on numerous levels.